I am an experiences mom. I’d rather give a trip that makes memories than any other gift, and I soak up all the minutes I can on those trips. 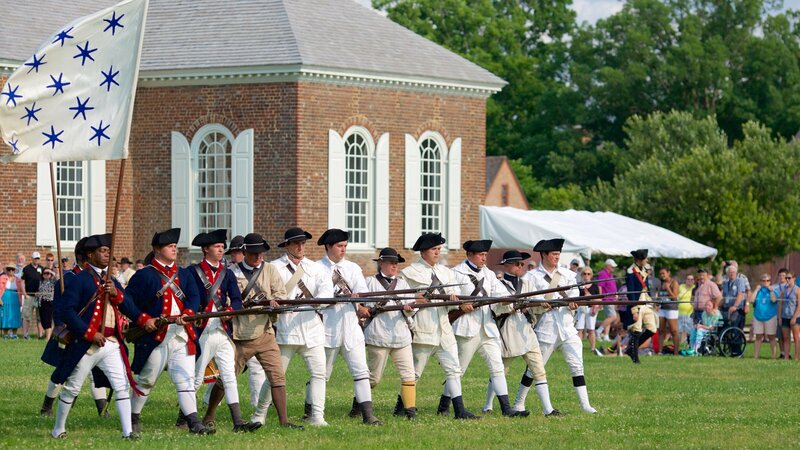 Recently we decided to head to Colonial Williamsburg for a family holidays trip between Christmas and New Years. We went about 3 years ago, and it was time to refresh everyone’s memory on the fun and history there. Since we Home School this also gets to count as great field trips (aka school days) that fit in perfectly as we study American History. Where else in the world can you walk down a street and run into Patrick Henry going off on the stamp act and the need for representation in Parliament?? 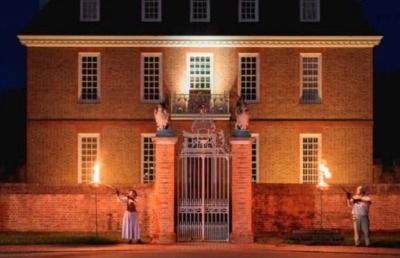 Or chat with Thomas Jefferson as he visits the city to sit in the house of Burgesses? My mom and one of my older girls made dresses. This year we took all 7 of us for 4 nights and three days to Williamsburg and spent less than $200 for the entire trip! Because our goal is to try to make a great fun trip each year, we use a Marriott Credit Card for most of our purchases. We also stay loyal and tend to stay at Residence Inn (owned by Marriott) hotels anytime we travel during the year. 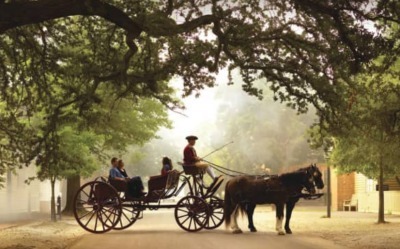 For this trip we used 120,000 points to stay at their Ford Colony Vacation Club location that is about 10 minutes from Colonial Williamsburg. Using points, meant we paid nothing for our rooms!! How do we earn points?? First, we charge almost everything when we are out shopping. We long ago stopped using debit cards (think Target data breeches). We also use these to pay for large recurring bills too like car insurance, health etc. If it can be paid with a credit card… you get the idea. I know Dave Ramsey is sitting in a corner crying, but don’t worry Dave we pay them off every month. The goal here is to get something in return for paying our bills! I pay my electricity bill and get a vacation… Right now you can start out with 87,500 points when you sign up for the card or enough for 3 free nights. Second, each hotel stay throughout the year for business ads up quickly. We earn 3,000-5,000 points per hotel stay. Traveling roughly 10 nights a year that is 30,000-50,000 points! Note: Hotel redemptions start as low as 15,000 depending on where you are going and the hotel available. So it won’t take long to earn some free trips. If you don’t want to do points (or you are saving your points for other trips), there are a number of small hotels in the area that are all quite nice. It really doesn’t have a bad part of town, so head to any hotel deal site and start searching. You’ll find basic rooms are around $40 that are right near the historical area. There are other ticket deals throughout the year, but the cyber week sale is the best they offer. Go ahead and put a reminder on your calendar for this November so you don’t miss it! 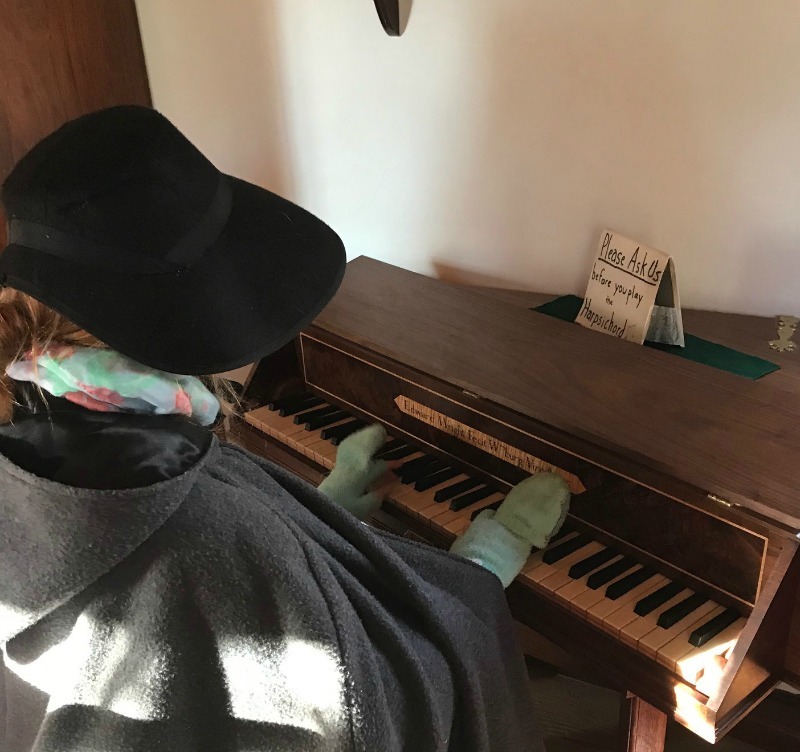 Visiting the cabinet maker we found a harpsichord that guests could play! Piano lessons paid off. This one is a no-brainer… if you want to saving on eating out, don’t do it. We packed all our food from home and cooked meals, made sandwiches and ate in. The only food we got out was a cup of coffee for my poor exhausted cold husband one day that was $3.25. In general paying a bit extra (or using more points in our case) to get a room with a kitchen can really pay off. One meal out for family of 7 can easily run $75-$100, so you do the math on where we would be without the kitchen on a 4 night trip. We brought two frozen meals we made ahead and then planned for two meals that use many of the same ingredients (they are my go-to travel meals). Bring the pre-made casseroles cuts down on ingredients and spices you need to pack and makes it feel like you got a night off from cooking! For lunch at Williamsburg there really aren’t a lot of great options to eat out anyway, so you are saving yourself from having to stand in lines and pay a lot for sandwiches. If you want to eat at a restaurant I recommend making a reservation as soon as they open. While we were there it was bitter cold (high of 19 one day) so we did eat lunch in the car one day. On warmer days there are tons of open green areas and private little gardens that all have signs that say “guests please feel welcome to use this space”. It was a joy one lunch to share our little garden with another picnicking family. Thanks for helping show my kids that we aren’t the only ones on a budget! To keep an honest tally of money spent we did eat out twice, once on the way up at a Chick-Fil-A and once on the way home at a BBQ restaurant. When it comes to long car rides with 7 people, stopping and getting out for a meal is more about sanity than the food. Total for these two stops $55. You can be much more awesome than me and plan picnics for these stops too, but in a loaded down car you may find that it causes more stress than it’s worth. If you like to get trinkets when you travel I would recommend that you window shop and make notes of things you liked. Typically anywhere you are the items they sell are available in other places much cheaper. 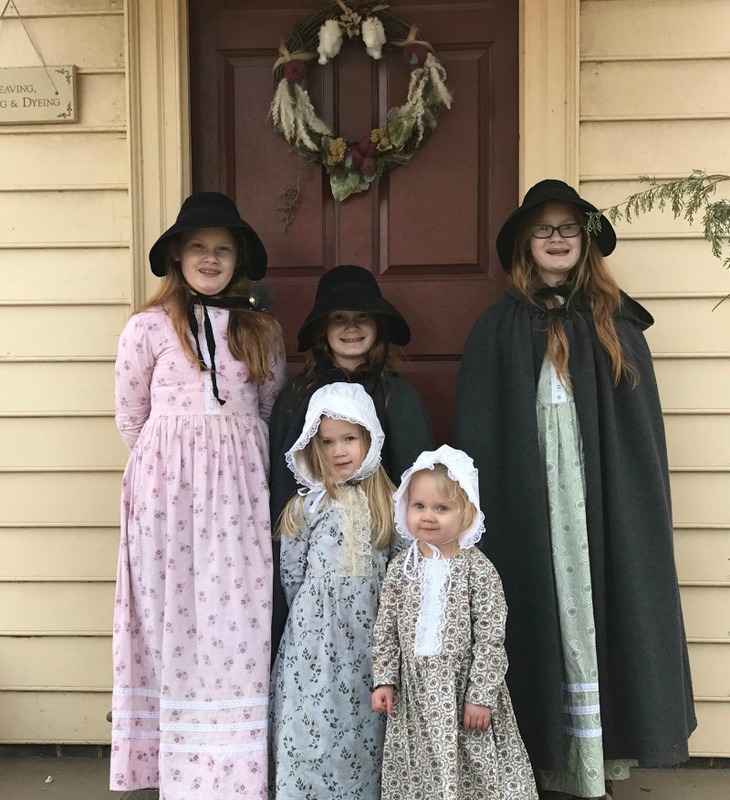 One thing we saw the big girls wanted was historical doll clothes patterns. They were $22 in the historical area shops, but had urls on them for the company that makes them… online they were on sale for $11. Google is your budgets friend! Since you have to get there, this needs to be included. We grab Shell gas station gift cards every time Publix runs in-ad $10 off coupons or get points by grabbing them at Kroger or other grocery stores. We also use the Shell Fuel Rewards program to double dip our savings. You can even link credit cards and store loyalty cards to earn extra savings. For this trip we used gift cards we already had saved up, so nothing out of pocket. If you’ve never been to Colonial Williamsburg, I encourage you to plan for at least 2 if not 3 days in the historical area. We went for three days this trip and still had a few places we never got too! There are so many buildings and tradesmen to visit that you will stay quite busy without needing to pay for additional activities. Make sure to register as soon as you can for the reserved free tours they offer. As long as you already have tickets they are completely free to you but they do fill up fast. Annual Pass holders get 25% off tours and night activities. Buy tickets that include other nearby parks together. These include Busch Gardens, Jamestown and other places and are much cheaper than buying the individual tickets. Check out the Yankee Candle Village. It’s huge and as long as you don’t buy anything it’s free (and fun). You can make your own candle at the store and it’s very fun (though not free). You’ll find coupons for the store all over town in coupon books and activity racks. If you have extra time, why not do a free self guided tour of William & Mary college right next to the historical area. The college is the second oldest university in America founded in 1693 and it educated numerous past presidents like Thomas Jefferson and George Washington. During the summer months Williamsburg does free movies on Sunday night on Prince George Street. Visit the Williamsburg Botanical Gardens for free. Each time of the year has unique reasons to visit. We choose Christmas for the beautiful decorations and because it’s the best time of the year to take a week off!